This is part one of a series. See Analyzing PyPI Data - 2 for part two. PyPI, the Python Package Index, gives a very crappy but simple interface to query metadata about its packages. I scrapped all of the packages metadata. 53,533 packages were scrapped (date: 2015-01-18), because I wanted to see if there is malware on PyPI (related to this question on security.SE). name: The longest package name is 80 characters long (Aaaaaaaaaaa...), the shortest packages have only one character. author: 911× "UNKOWN", 741× empty, 195× "None", 151× "Zope Foundation and Contributors". There are about 22,000 different authors. There are 595 authors who wrote more than 10 packages. author_email: 2059× "UNKOWN", 932× empty, 323× "[email protected]", 216× "None" and 204× "TODO". maintainer: 46879× "None", 5507× empty, 17× Paul Boddie. requires_python: 53467× "None", 3× "UNKNOWN", 2× ">=2.7,!=3.0,!=3.1", 2× ">=2.5", 1× "2.6", 1× ">= 3.3", 1× ">=2.4", 1× ">= 2.7" - that's it. No other values. Seems as if this is pretty much useless. docs_url: Either begins with http://pythonhosted.org or is empty. 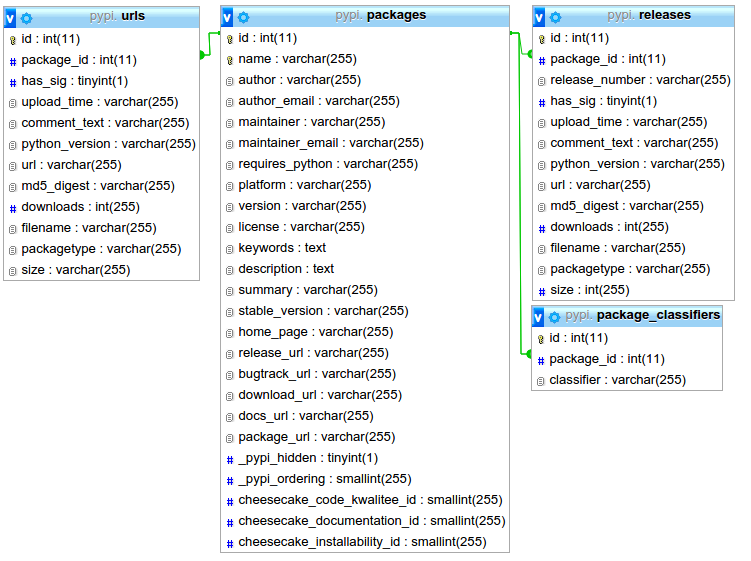 version 73 [In Progress] Python middle layer for interacting with Redis data easily. cheesecake_installability_id, cheesecake_documentation_id, cheesecake_code_kwalitee_id should have NULL and None should be casted to NULL. The data type is likely to be numeric. So I changed the types in the database. Let's continue. maintainer and maintainer_email is interesting for people who want to send bug reports. If this is empty, I would guess the package is dead. You can see that there are alternative ways to express the same thing. Also, the ";" should not be here as the manual states it should be a list. The manual is also too short for this entry. It only says "a list of platforms" which seems to be pretty much useless. A list of platforms on which this distribution is known to work. You should provide this information if you have reasons to believe this distribution may not work everywhere. 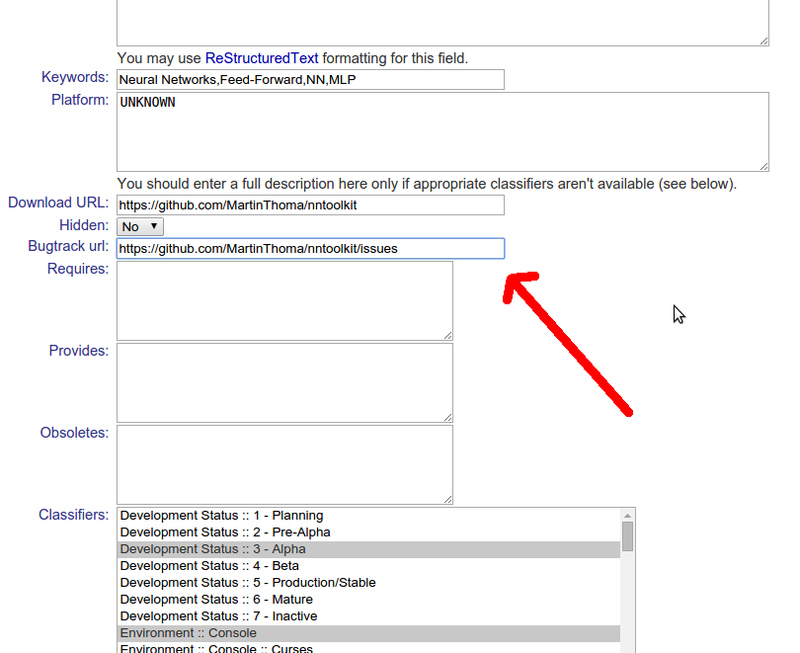 This information should be reasonably concise, so this field may refer for details to a file in the distribution or to a URL. Another important one. Add a license to your software! and about 6500 other licenses. Most might be variants in writing, e.g. These indicate that people have no idea what to input there. tldrlegal.com might help in that case. I think the Python community should try to eliminate variants in writing license names as it makes finding, filtering and analyzing packages more difficult. Python makes use of so called trove classifiers. They are defined in PEP 301 and listed here. There are 94 trove classifiers with five or less packages which use this classifier. I guess many of them are not in the official list of classifiers. Can anybody explain what this means? What is the biggest Python package? 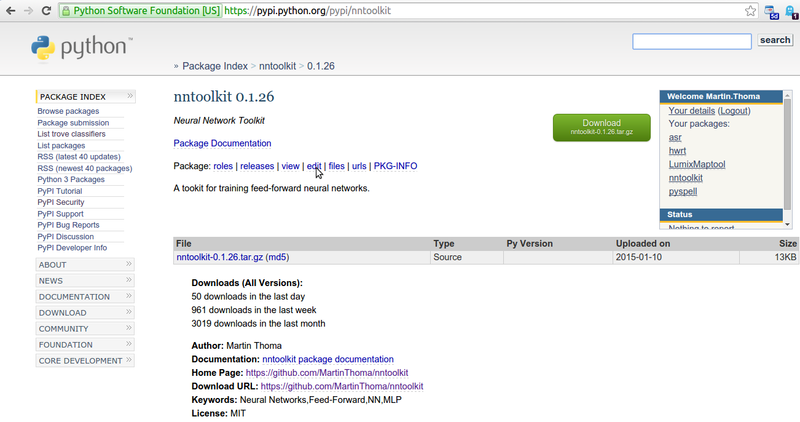 Why are some packages on pypi.python.org/simple, but have no page? How can I find out when the last interaction on PyPI happened for a given package? What is cheesecake_code_kwalitee_id on PyPI good for? Build a dependency graph: Some of the code was already written. However, one has to download about 25 GB of data, extract it and run over those files. This is quite a bit of work. 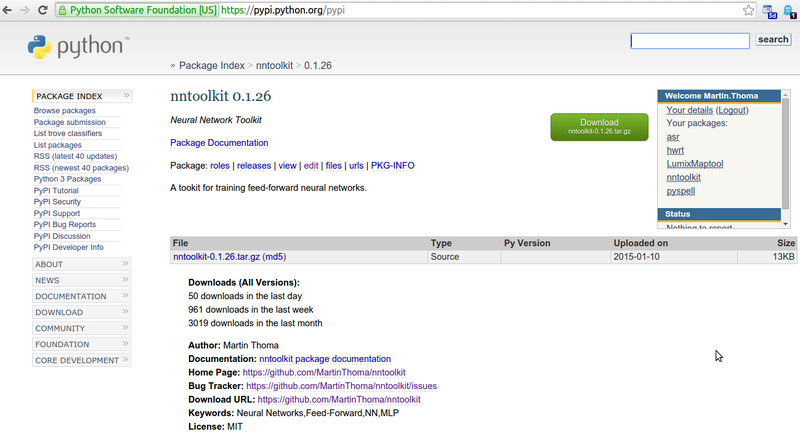 Check which package names are prefixes of other package names.